A cousin recently asked about Minerva Tolliver Mannin(g)’s Native American background. She wondered “if [I] have any evidence that Enoch and Minerva Mannin were Cherokee?” I told her that I no such evidence and I don’t believe she did (because of my X-Chromosome analysis). I then pointed her to my blog article “DNA, the X Chromosome & Minerva Tolliver Manning.” Then, I thought about the issue a bit more. Mitochondrial DNA (mtDNA) is quite simple. You receive your mtDNA from your mother. I received mine from my mother, but my son received his from his mother and none from me. Also, mtDNA doesn’t change much over time. That means my mtDNA is the same as my mother’s, which is the same as her mother’s (Madonna Montran), which is the same as her mother’s (Ida Barber), which is the same as her mother (Sarah Blackhurst), and the same as her mother (Fanny Taylor). 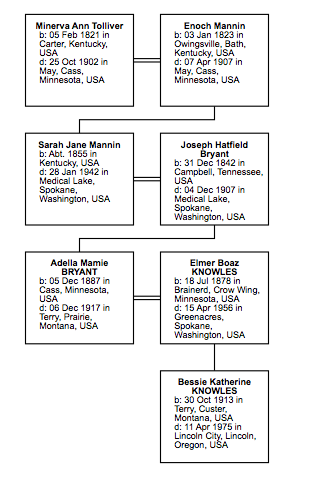 The same process is true for Minerva Tolliver Mannin(g)’s descendants. All of her children have her mtDNA, however, only her daughters carry that DNA on to their children. To prove, beyond a shadow of a doubt that Minerva was Native American, if we find a descendant of her daughter’s daughter’s daughter and that person is tested, the haplogroup that descendant is in would prove the descendant was Native American. 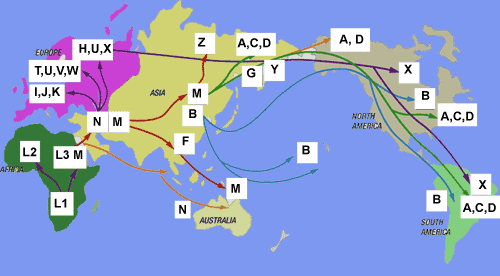 Native Americans have mtDNA haplogroups A, B, C, D, and sometimes X. My mtDNA haplogroup is T2b, which clearly identifies my maternal ancestry to be from Europe. If the female descendants of Minerva are A, B, C, or D, we can be certain that Minerva was Native American. I Minerva’s female descendants are I, J, K or T, U, V, or W, we can be fairly certain that Minerva’s female ancestry was from Europe. The key in using mtDNA for genealogy, or any DNA for that matter, is to determine who should be tested in order to prove a particular question. In this case, the proof comes from finding a child of the female line of Minerva and have that individual tested. I’ll admit, my research into descendants of Minerva is not complete. I welcome anyone who has information regarding her descendants, particularly female descendants, to help me fill in the many blanks and gaps that I have. That said, this is what I think I know. Minerva Tolliver Mannin(g) had five daughters, Nancy Ann, Sarah Jane, Mary Ermaline, Gresella, and Prudence. · Flora Belle, Sarah A. Sadie, and Nettie. I have no further information regarding Sarah, Sadie, or Nettie. · Flora Belle married George Wesley Horn. They had two or three girls, two of whom died as children. One child, Helen Elvira Horn, married Harold Anderson and lived until 1968. I have no records regarding her children. Sarah Jane married Joseph Hatfield Bryant. They had five daughters. · Nancy Ellen Bryant married John M Horn. They had one girl that I know of, Mary A. Horn. I have no marriage information or children information regarding her. · Adella Mamie Bryant married Elmer Boaz Knowles. They had five daughters. One died as a child, leaving four to consider. · Elsie Lillian Knowles married Vernon Smalley. I have not information about any children of theirs. · Clara Lavina Knowles married Luther Elbert Parker. I know of one child of theirs Elsie Joan Parker. · Lorraine Grace Knowles married Richard Markham Taylor. They had three daughters, two of whom may still be living. I also have information regarding several of those children’s children, so this line may be my best area of further inquiry and contacts. · Bessie Katherine Knowles married Albert Dickerman. They had one daughter that I know of, Lillian Katherine Dickerman. Mary Ermaline married Thomas N Jones. I know of no children of them. Gresella (or Greselle) is a mystery to me. I have no marriage or child information regarding her. Finally, there is Prudence. I believe she was married twice. Once to Frank P. Bare and again to someone surnamed McDonald. I don’t know of any children that she had. If you are descended from any of these individuals, I would really like to hear from you. I would like to fill in Minerva’s descendants as well as I can. Please contact me either through commenting on this blog posting, directly via my email address (dontaylor50 (at) me.com), or though Facebook (https://www.facebook.com/dontaylor50/). I will also try to contact any of the descendants that I do know of, particularly in the Knowles, Taylor line and see if any of them would be interested in doing a mtDNA test to prove conclusively if Minerva was Native American or not. I plan to continue working on my own and fill in whatever descendants that I can. My grandfather , Elbert Monroe Barnett, was brother to Emma Nettie, and Sadie and so forth. I met Nettie in Eureka Ca in 1947 or 48. She was married to Will Horn. Sadie lived in Wisconsin. do not know where. Grandfather went to visit her before she died. She gave him a car, a Studebaker 8 cylinder. We went to visit some Indian relatives in Minn, maybe Cass county. I asked my grandmother who they were she replied that they were grandfathers cousins. Grandfather said they were Cherokee.